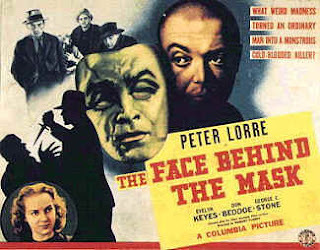 In January 1941, Columbia Pictures released The Face Behind the Mask, a horror-edged crime drama directed by Robert Florey who had overcome any resentment incurred over being replaced as expected director of the 1931 Frankenstein (see my review of 14/2/2016) to become one of the top B-movie directors in the business. Allen Vincent and Paul Jarrico’s screenplay is a fairly predictable tale of goodness turning to crime by desperate circumstances, but is elevated by the qualities of its lead Peter Lorre. The story gives ample opportunity for him to display his range encompassing the extremes of low and high status with sinister self-possession. He plays Janos Szabo, a wide-eyed and eager-to-please Hungarian immigrant fresh off the boat in New York city. His naivete is fortunately protected from exploitation by a happenstance befriending by decent police Lieut. O’Hara (future Three Stooges support Don Beddoe) who suggests a suitably cheap hotel where he can lodge. 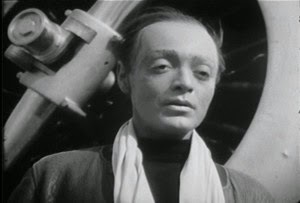 One night he is the terrible victim of a fire there resulting in third-degree burns that cause all future employers to turn down his scarred appearance. Thus, his open-hearted innocence is crushed; his dreams of a good life virtuously earned are gradually resculpted into a hardened life of crime due to the more negative chance influence of a petty criminal Dinky (a sympathetic turn by George E. Stone). Janos’s mechanical skills serve him so well as a jewel thief that he soon becomes the boss of his own high-rolling heist gang, using his share of proceeds to pay for a plastic surgeon’s rubber mask of his former face. 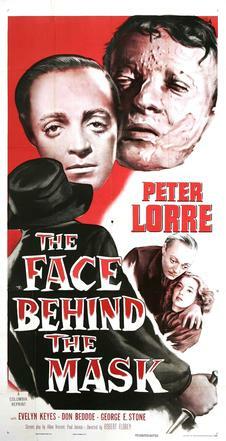 This allows effective and subtle makeup that gives Lorre’s visage a sleek, slightly waxen look through which he channels his trademark inscrutability now that he has committed to the bitter consequences of the dark side. His little empire must be preserved –there is no room for the sensitivity of his former self. Initially, Janos and Helen move into their idyll of the dream home with a porch and pooch before sadly the third act takes things to the highest flinty level of emotional stakes from which there is no turning back. 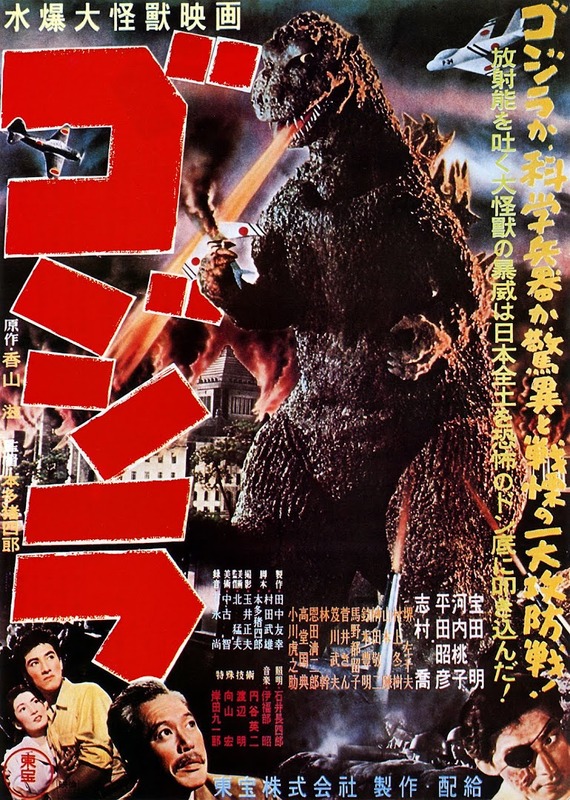 Here the plot chugs along with energy if not originality. When Janos’s sadistic old associate Jeff Jeffries (James Seay) cannot torture Janos’s location out of Dinky, his old friend is shot and tossed out of the gang’s moving car, yet manages to warn him of Jeffries’ wrath. Tragically, this comes too late; Helen is blown up by their booby-trapped car (come to think of it, the exact same horrific turning point leading to the ruinous calfication of Michael Corleone). “Foolishly in vain you will hope. Hope that somehow you will be saved. And slowly you will surely die”. This bravura highlight in an otherwise unremarkable movie is then capped by O’Hara’s arrival, tipped-off by Janos, revealing a note that thanks him for his kindness and confirms a last vestige of finer feeling from this lost soul. All told, The Face Behind the Mask is worth seeing for fans of one of the great horror actors of sly, delicate nuance.